E-book readers have been around for some years already, and the amount of progress in that department hasn’t really caught on as fast as we would like to have. After all, we are finally about to take the plunge into the world of color e-readers after some time, which is pretty sad considering how other devices such as cell phones have long adopted the color feature for some time already. Perhaps there really isn’t a need for color in an e-reader, but times might have changed as well. After all, e-readers are meant to be lightweight and consume as little juice as possible so that it can complement the digital page turners that you have already uploaded unto it. Hanvon jumps aboard the color bandwagon with their new e-reader, thanks to technology from E Ink, whose black-and-white displays are used in 90 percent of the world’s e-readers, including the Amazon Kindle, Sony Readers and the Nook from Barnes & Noble. Why the E Ink screen? Well, it wins over LCD in two sections – they sip far less battery power and are easy on your eyes even in the glare of direct sunlight. Unfortunately though, this new color E Ink display does have its drawbacks – it will not be as sharp and colorful as LCD, where the colors themselves look muted, as though you were looking at a faded color photograph. Not only that, E Ink is unable to handle full-motion video but does simple animations at best. That might not sound like much at the moment, but at least it is progress in some way. Guess the Hanvon color e-reader will be more suitable as a childrens’ device instead of being one that targets adults, making it more of an educational tool than anything else. Expect this device to sport a 9.68-inch color touch screen when it hits China this coming March, with prices starting from around $440 after conversion. This makes it more affordable than an iPad in China, which is actually going for about $590. 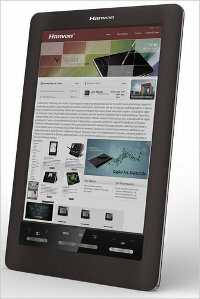 It will be marketed as a business product, complete with Wi-Fi and 3G wireless connectivity to provide it more punch. There is also a chance of this hitting the US, so stay tuned! how about this? I need a pdf reader too. please email me.